I didn’t have high hopes for these cupcakes. In fact after the four failed attempts at maple candy this weekend and tasting the delicious Whiskie Bits cupcakes, I started to get a little depressed. I tasted the baked cake on its own and while it tasted fine, I wasn’t very excited it about it. Well in the end, I ended up loving the cupcake – it ended up being more than the sum of its parts. The cake is light, almost angel food texture, with juicy, chewy corn kernels scattered throughout. The frosting is very creamy with a nice tartness. 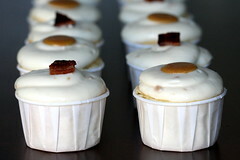 Taken together with some maple candy and bacon…. Yum! I was pleasantly surprised with this combination, now to see how they go over at work tomorrow. Update: The cupcakes went fast and seemed to go over quite well. I shouldn’t have underestimated the appeal of bacon! I got the recipe from the Ohio State University website, fact sheet F-46-02. I tried the “Crunchy” Hard Maple Sugar Candy and the Molded Soft Sugar Candy. The hard, crunchy stuff tasted a lot like the maple sugar candy I used to get in Vermont, but I couldn’t mold it or make it into anything very good looking. The molded, soft stuff didn’t quite pan out I like I had hoped, but I did manage to get it into small disks. Attempt at your own risk. 1. Sift flour, sugar, salt, and baking powder into the bowl of a standing mixer. 2. In a medium bowl, combine oil, egg yolks, water, and maple syrup. Stir to combine. 3. On a low setting, start to beat the dry mixture and slowly add the wet. 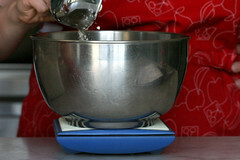 Increase the mixer speed to high and beat until ingredients are incorporated. 4. Transfer mixture to another bowl. Wash and dry mixer bowl. 5. Whip egg whites with whip attachment on medium-high speed until foamy. With the mixer on medium speed, add cream of tarter and slowly add sugar. Beat on high speed until stiff peaks form. 6. Scoop a cupful of the stiff egg whites into the batter and stir to combine. This will lighten up the batter. 7. Transfer the batter to the egg whites and gently fold until there are no more streaks of egg white. 8. Gently fold in the corn kernels. 9. 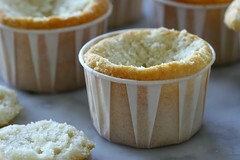 Scoop into cupcake cups and bake at 350 F for 20-23 minutes or until a toothpick comes out clean. 4. Add 3 cups of the powdered sugar and maple syrup. Beat until combined. 2. Top with a piece of homemade maple sugar candy or crispy bacon. Topping a baked good with fried one is indeed excessive. But I needed an excuse to make doughnuts, so here goes. Firstly, I must take a moment to appreciate the doughnut. Doughnuts should be an occasional treat. They have little redeeming value other than tasting great and are fried! But boy do freshly fried doughnuts taste so very, very good. I have vowed that if I am to eat a doughnut it will only be one a fried by my own hands. I used the recipe from Richard Bertinet’s Dough: Simple Contemporary Bread. He has a unique kneading method which he demonstrates clearly in the included DVD. I am providing the mixer version of the instructions as my words will be inadequate to describe his method. I made one slight change from his recipe (the frying temperature) and recommend that you plan on eating them all – with friends – the day, the moment even, they are fried. 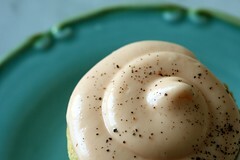 Now for the cupcakes – they tasted like a latte – sweet and moist with a milky coffee flavor. I enjoyed the end result like it was two desserts. 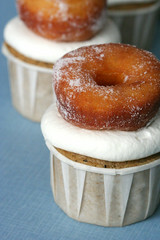 I dipped the doughnut in some of the whipped cream and ate that, then had the cupcake separately. Both were tasty, but I must admit that the doughnut did out shine the cupcake. Maybe it was the novelty. 3. Add eggs one at a time, beating until incorporated. 4. Whisk together flour, baking powder, salt, and coffee grounds in a bowl. 5. Measure out coffee and milk together. 7. Add about one third the coffee/milk mixture and beat until combined. 8. Repeat above, alternating flour and coffee and ending with the flour mixture. 9. 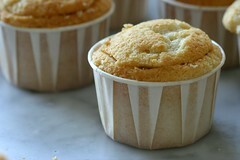 Scoop into cupcake papers about two-thirds to three-quarters full (depending on whether you want flat or domed cupcakes. Note that these cupcakes will shrink slightly when they cool). Tip: Be careful when adding the coffee/milk mixture to the batter. If you add it too quickly the mixture will look curdled. Add small amounts and beat well to incorporate. 1. Whisk cream on high speed until soft peaks form. 2. Add sugar (more or less depending on your taste) and whip until thick. 1. Warm milk over low heat until it is ay body temperature. It should feel neither warm nor cold when you touch it. 2. Measure the flour into your mixer’s bowl. Rub in the yeast with your fingertips until it disappears in the flour. 3. Rub in the butter until its a sandy texture. Rub in the sugar and salt. 4. Using the dough hook attachment, turn the mixer onto the lowest speed. Add the eggs and milk. Mix for 2 minutes. 5. Turn up to medium speed and mix for 6-7 minutes until the dough becomes smooth and elastic. 6. Gently remove the dough from the bowl with the help of a plastic bowl scraper onto a lightly floured surface. Form into a ball. Place into a lightly floured bowl and cover with a lint-free towel and set in draft-free spot to rise for 1 hour. 7. 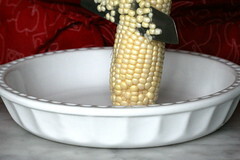 Gently remove the dough from the bowl with the help of a plastic bowl scraper onto a lightly floured surface. Cut into two equal portions with your scraper. Gently roll out to about 1/2 inch thick, turning and using flour only as needed. 8. 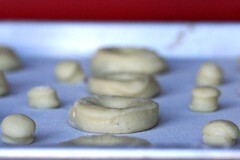 Cut out doughnuts and their holes using a circular cutter and a large pastry tip, respectively. 9. 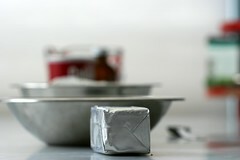 Set on a lightly oiled and floured baking pan with sufficient space between each. Cover with a lint-free towel and set in draft-free spot to double in size or for 45 minutes. 10. Heat the peanut oil in a high-sided, 8″ diameter pan to 350 degrees. Using a slotted spoon gently add about 5 doughnuts to the oil. Allow them to fry on one side until golden, about 45 seconds. Flip and repeat on the other side. Remove doughnuts onto a sheet pan covered in paper towels to drain. Continue in the same fashion with remaining doughnuts. 11. 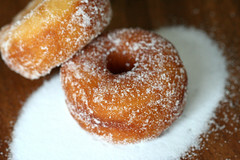 Roll drained doughnuts in the sugar. Eat. Note: I got about 24 mini doughnuts and doughnut holes plus a small loaf of bread out of this recipe. I took the scraps from cutting, quickly kneaded them together and shaped into a loaf. I baked the loaf at 425 degrees for 11 minutes until golden on top. Tasty! 1. 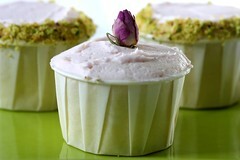 Top cooled cupcakes with a dollop of whipped cream. 2. Top frosted cupcake with a doughnut. These luscious cupcakes are a childhood treat reinvented for the kid in all of us. Welcome fall with a few friends by baking up a batch of these challenging, yet satisfying goodies. The soft, tart apple shines through the spiced, not-so-sweet cake and the cream cheese filling lends a sweet smoothness. All this is topped with a robe of chewy, sweet, and slightly salty caramel. 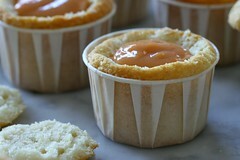 Be sure to bake, cool, and stuff the cupcakes before starting the caramel. You want the cupcakes ready and waiting as soon as the caramel comes off the stove. Please note that you will need a candy thermometer for this recipe! 1. Rinse and core the apples. Place them on an ovenproof pan or baking sheet and bake for 30-40 minutes until soft. 2. Remove the apples from the oven, let cool slightly, then remove peel and mush the apple with the back of a fork. Measure out 1 cup of apple mush and set aside to cool. 3. Combine flour, sugar, ginger, cinnamon, nutmeg, baking soda, and salt in a medium sized bowl and whisk to combine. 4. Crack the eggs into a separate, medium sized bowl and beat with a form to break up. Add the oil, apple juice, vanilla, and cooled apple mush and mix to combine. 5. Combine the wet and dry ingredients until all ingredients come together. 6. Scoop into cupcake papers about 3/4 full so cupcakes will have a significant dome. Bake at 350 degrees for 20-22 minutes, rotating the pan after 15 minutes, until a toothpick comes out clean. 1. Be sure to bring the butter to room temperature by letting it sit out for 1 or 2 hours. Then beat the butter vigorously with an electric mixer. 2. Scrape the bowl and add the cream cheese and beat until combine. 1. Cut out a cone from each cupcake. Flip the cone and cut off the excess. Set the top aside. 2. Fill each cavity with the cream cheese filling. 1. Bring the butter, brown sugar, corn syrup and sweetened condensed milk to a boil over medium-high heat stirring to combine. 2. With a wooden spoon, stir all ingredients together and then slowly add the heavy cream. 3. Continue to stir for about 20 minutes until the caramel reached 248 degrees. It is important to continuously stir the mixture and to allow it to reach temperature. 4. Remove from heat and stir in the vanilla and salt. 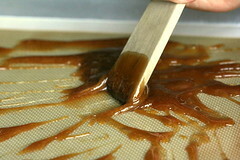 Transfer to a bowl and continue to stir for 2-3 minutes allowing the caramel to cool slightly. 1. 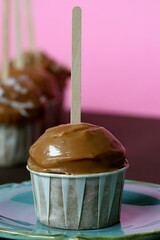 Using a small offset spatula, frost each cupcake with the caramel. 2. If desired sprinkle warm caramel with any number of toppings, like coconut or crushed nuts. 3. 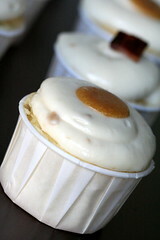 Transfer the cupcake into the freezer to allow the caramel to set without dripping over the edge of the cupcake paper. 4. Continue frosting and topping the cupcakes and try to work fast. As the caramel cools, it becomes less spreadable. If possible work in pairs and let your helper top the cupcakes and transfer them to the freezer. By the time you reach the last few cupcakes, you will not longer need to freeze them and you can take all the cupcakes out and transfer them to the counter. 5. Top off each cupcake with a popsicle or craft stick to finish off the look. 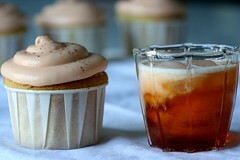 I really, really want a solid Thai Tea cupcake recipe. I have been playing around with just about every product I could get my hands on and trying a variety of recipes and approaches. Getting the Thai tea flavor in the baked good was just not working. While the cake tasted fine… in most cases ended up tasting like corn and not Thai tea. I finally decided to skip the flavor in the cake and focus it in the filling and frosting. I also used yet another new product and this one is my favorite so far. I made Thai Ice Tea per the directions and the result is most definitely whatever I am being served in San Francisco Thai restaurants… the Thai Tea flavor I am accustomed to and love. These cupcakes tasted luscious – no funky after tastes, no cloying sweetness. The cake is the not-too-sweet balance to the creamy sweetness of the filling and frosting. We tried these soon after assembly and they just sort of burst into a creamy mass. I think with some time in the refrigerator the flavors will deepen, the filling will become one with the cake, and the experience should be equally as good, perhaps a little better, and definitely a bit neater. I don’t know if this is the end of my search, but I am definitely pleased with what transpired today. 3. Whisk together flour, baking powder, baking soda, and salt in a bowl. 4. Measure out vanilla and milk together. 5. Add about a third of the flour to the butter/sugar mixture and beat to combine. 6. Add about one half the milk mixture and beat until combined. 7. Repeat above, alternating flour and milk and ending with the flour mixture. Transfer to a bowl. Clean mixer bowl well and dry thoroughly. 8. Whip egg whites until soft peaks form. 9. Mix in about a half cup of egg whites in to the batter, then fold the batter into the egg whites, gently until all egg whites streaks are gone. 10. Scoop into cupcake papers about two thirds full. 11. Bake for 20-25 minutes until a cake tester comes out clean. 1. In a small bowl, whisk egg yolks and set aside. 2. In a medium bowl, mix sugar, flour, and salt together and set aside. 3. 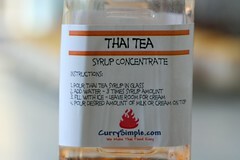 In a small saucepan, bring milk and Thai Tea syrup to simmer over medium-low heat. 4. Pour about a half cup of the milk over the dry mixture and mix to combine. 5. Transfer back into the pan and continue cooking over medium-low heat, stirring constantly, until mixture thickens. About 5 minutes. 6. Slowly add a small amount of the hot mixture to the eggs and mix to combine. Transfer back into the pan and continue cooking over medium-low heat, stirring constantly for 3 minutes. 7. Transfer to a bowl, let cool for 10 minutes. Then cover with plastic wrap and refrigerate until cool. Note: You will have extra filling. I decided against splitting the recipe in half as it uses the 4 egg yolks for the 4 whites in the cake recipe. If you don’t want extra, try cutting the recipe in half. 1. Bring cheese and butter to room temperature by letting it sit out for 1 or 2 hours. 3. Beat butter and cheese at medium speed until creamy. 4. Add half of the sugar and 1/4 cup of Thai tea syrup. Beat until combined. 5. Gradually add remaining sugar (more if you have to) until you get to the consistency and sweetness you like. Add more syrup to get to the flavor you want. I added 2 more tablespoons. 2. Fill the cavity with a teaspoon of cream filling. 4. Frost then sprinkle with crushed Thai tea leaves. I made an impromptu decision on a Thursday afternoon to make cupcakes for a party on Friday afternoon. 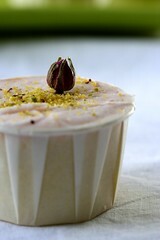 I knew I wanted to make pistachio cupcakes, my homage to Indian sweets. I didn’t have a lot of time or options, so I ran out at lunch to the Ferry Building, conveniently located across the street from work. 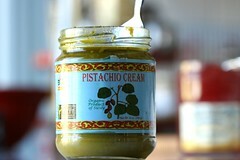 I managed to find some pistachio cream (at $19.99 for 8 ounces! Ouch!) 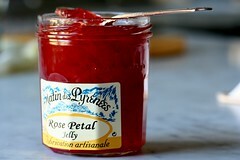 at the Village Market and rose petal jelly and small, edible rose buds at Boulettes Larder. I decided on a chiffon style cake this time around. I want to make an important point outright. This is a far trickier method than the creaming method that I use for most of the recipes in the blog. Many things can always go wrong in baking; this is even truer with this style of cake. It shouldn’t stop you from trying, but if there is one thing I learned from the professionals that I took classes with, the key is being able to work with whatever the outcome is. In this case, I made quite a bit of batter. As such, my oven was packed with cupcakes and they were baking unevenly. Did I risk opening the oven to shift them around? Opening an oven too early in the process can cause a draft and result in fallen cupcakes. Or did I leave them be and deal with some cupcakes being over done? In the end, I waited until about halfway through the baking time, then opened the oven and shifted the cupcakes around. In the end, I would say about 8 of the 36 cupcakes fell. I used the good ones for the party and covered the others with a bit of frosting and saved them for the family. The pistachio cake was an experiment. I was happy with the outcome. Despite the baking issues I had, the cake was tasty, and in my opinion very pistachio-y. It was light and airy, just like chiffon should be. I went light on the frosting so it wouldn’t overpower the cake. I didn’t get much of a rose flavor from the jelly, but the color was nice and I could definitely smell roses (most likely from the buds). If I had planned ahead, I would have order some rose water or syrup to help liven the frosting some. 2. In a medium bowl, combine oil, egg yolks, water, and pistachio cream. Stir to combine. 3. On a low setting, start to beat the dry mixture and slowly add the wet. Increase the mixer speed to high and beat until pistachio cream is incorporated. 6. Scoop a cupful of the stiff egg whites into the batter and stir to combine. This should lighten up the batter. 7. Transfer the egg whites to the batter and gently fold until there are no more streaks of egg white. 8. 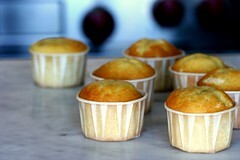 Scoop into cupcake cups and bake at 350 F for 22-25 minutes or until a toothpick comes out clean. Tip: Cake flour is a must for chiffon. All-purpose won’t give you the same delicate texture. 1. Beat butter until creamy, scrape bowl. 2. Add 3-4 cups of sifted powdered sugar and jelly, beat until combined. 3. Add more powdered sugar as needed to get to whatever consistency/sweetness you wish to acheive. 1. Frost cooled cupcakes lightly with buttercream. 2. For pistachio garnish, grind up pistachios in a small food processor. 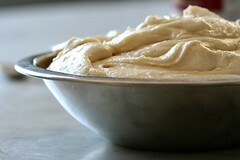 take up some of the ground nuts into your hand and press the edges of the frosted cupcake into the mixture. 3. Otherwise top with edible rose bud or edible rose petal. 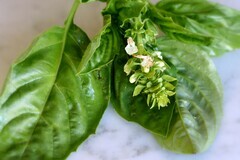 I have been very tempted to try a basil flavored cupcake. I made basil simple syrup a couple of weekends ago and picked up a selection of fruits to taste it with. My favorite match was most definitely basil and raspberry. I finally got around to the cupcakes this weekend. 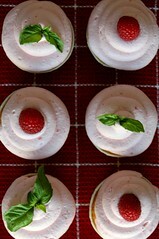 I made a basic vanilla cupcakes, light and fresh raspberry mousse frosting, basil cream, and mint cream. I decided it would be easy enough to prepare fillings with basil and mint then see what combination I preferred. 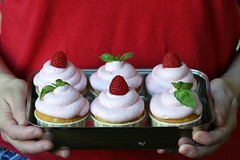 The cupcakes turned out great, really fruity and fresh. I suggest serving them with some extra fruit… I wanted a raspberry with every bite. As it turns out, I prefer the mint. The taste was still herby like the basil, but not as distinct or distracting. It’s not that I didn’t like the basil. I did. I just feel like I would need to do something more, like find a third flavor to balance the two. 10. Bake for 20-22 minutes until a cake tester comes out clean. 1. Bring sugar and water to a boil, stir until sugar dissolves. 2. Chop basil or mint and add to the mixture. 3. Boil for 3 minutes. 5. Beat heavy cream on high until stiff peaks form add the five to six tablespoons of syrup to taste and beat until combined. 1. Combine raspberries and sugar in a saucepan and cook over medium heat. 2. Stir mixture until it is basically a liquid. 3. Stir in gelatin, continue to cook until dissolved. 4. Remove from heat and transfer to a medium sized bowl. Refrigerate overnight. 5. Beat heavy cream on high until stiff peaks form. Add the three tablespoons of sugar and beat until combined. 6. Mix about a third of the whipped cream into raspberry mixture until well combined. 7. Fold in remaining whipped cream. 1. 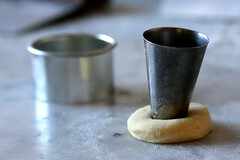 Using a small knife, cut off the top of the cupcake in the shape of a cone. Flip the top over and cut off the cone. 2. Fill the cavity with a teaspoon of basil or mint cream. 4. Pipe on the raspberry mousse and decorate with fresh herb and/or raspberries. I wasn’t planning on baking this weekend. I was planning on “taking the weekend off”. But all it took was my friend asking, “What about cupcakes for Sunday night?”, and I was all over it. Any excuse to bake, I guess. I was pressed for time, so I went with the cherry chocolate cupcakes again. Mostly because they were so good, my cousin hadn’t tried them yet, and I had all the ingredients. 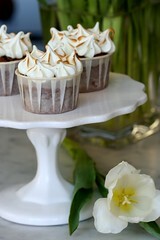 I did change the frosting from fennel cream cheese to fennel meringue because I was itching to use the blow torch. The cherry chocolate cupcake is, I am convinced, a great recipe and a crowd pleaser. The meringue frosting is a bit tricky, and I need to work on the recipe some, but I am providing it here for the adventurous. 1. Heat 1 tablespoon of sugar and the water in a small pan over medium heat, stirring until sugar is dissolved. 2. Crush the fennel seeds slightly with a mortar and pestle. 3. Add the crushed seeds to the sugar and let boil over medium-low heat for 2 to 3 minutes or until the mixture is somewhat syrupy. See step 6 for what to consider when cooking the sugar syrup. 4. Whisk the egg whites and 1 cup of sugar over a water bath in the standing mixer bowl until it reaches a temperature of 110 degrees fahrenheit. This only takes only a couple of minutes. 5. Transfer to standing mixer and whisk using whisk attachment at high speed until soft peaks form. 6. Drizzle fennel syrup into the mixer. This part can be tricky. For one, you don’t want the syrup too watery or it can deflate the meringue. But if the syrup is cooked too much it could harden. Aim for a soft ball stage. If you see the meringue start to deflate put less of the syrup in and all of the fennel seeds. Note: Once again, I had a lot of frosting left over. So, I spread it out on a silpat covered baking sheet, threw it in a 350 degree oven for 30 minutes, turned off the oven and left it there while we ate dinner. The result was like a big fennel, meringue cookie that was crispy, chewy, and tasty. 1. Pipe meringue frosting onto cupcakes using a large star tip. 2. 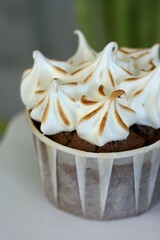 Using a blow torch, brown the meringue.